I recently had the chance to drive a Fiat 500L in Istanbul, Turkey, a wonderful Eastern European city that’s home to a wide range of beautiful mosques, and excellent restaurants, and lovely neighborhoods, and people who drive like they’re fleeing the Kraken. WHAT ACTUALLY HAPPENED: The Fiat 500L made me long for the days of mule-based transportation. Before I get started here, I want to say that I actually liked the 500L before I went to Europe and spent a day behind the wheel. I liked the design, I liked the pricing, I liked the packaging, I liked the fuel economy, and I even liked the fact that it’s built in a mid-sized Eastern European city whose primary attraction is called the Museum of Genocide. 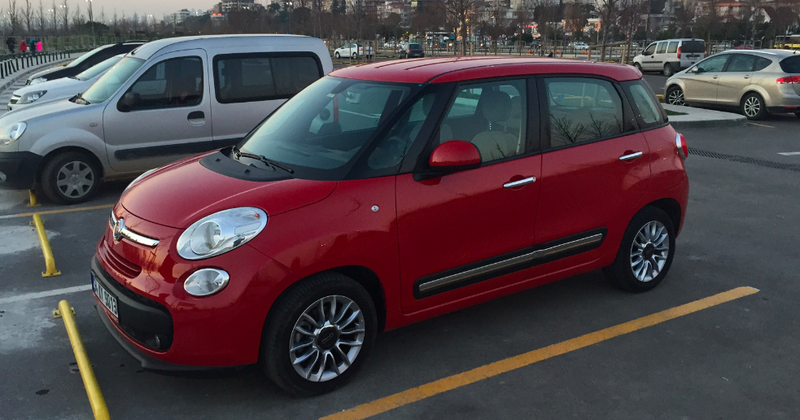 So I was very excited when the happy Turkish man at Avis told me I would be getting a bright red 500L for my day of driving around Istanbul. “At least it’s not a C-Elysee,” I said. And then I climbed behind the wheel. First and foremost, it should be noted that much of what I liked about the car is, indeed, true. The interior is bright and airy. There’s a lot of space. Gas mileage is good. So good, in fact, that I drove the car around Istanbul for an entire day and still managed to return it so close to the “full” line that they didn’t assess the typical “rental car fuel charge,” which is contractually defined as market fuel prices plus an iPad Mini. Oh, and another thing: the see-through A-pillars are one of the best safety features known to man. Forget blind spot monitors, and lane keep assist, and automatic high beams, and blah blah sensors, and blah blah alert. Just give me some see-through A-pillars and I’ll be on my way. Because of them, I only hit two Turkish men begging in the street, which I am told is a new low score among tourists visiting Istanbul. So what’s so bad about the car? you might ask. If you liked the interior, and the fuel economy, and the passenger room, and the safety features, what could possibly make you hate every second of driving the 500L? And the answer is: the transmission, which is a semi-automatic that was created by a talented team of Fiat engineers, and designers, and product planners, presumably working together over a 20-minute conference call. I’ll explain it like this. If we were measuring the Fiat 500L’s benefits and drawbacks in terms of water storage, all the good things I just named would fill a little Evian bottle; the kind of Evian bottle Turkish men try to sell you on the street, and you refuse, because you’re pretty sure it’s half-full of their saliva. And then, over in the “drawbacks” column, my problems with the 500L’s transmission would fill Lake Tahoe. 1. You put your foot on the gas. 2. All the other traffic goes. 3. People on bicycles go. 4. Pedestrians start to go. 6. Working Internet reaches commercial airplanes. 7. Entire animal species go extinct. 8. The city of Cleveland becomes a top honeymoon destination. 9. The 500L’s transmission selects first gear and you’re on your way. Seriously: I’ve never driven a car that hesitates so dramatically when you push the accelerator. And I am including in this statement subcompact cars, hatchbacks, large trucks, vans, scooters, that PT Cruiser I crushed, vehicles whose parking brakes are on, vehicles I have driven in dreams, etc. And then there’s the problem with the gear selector itself. In a normal automatic car, you have the gears arranged in a simple P-R-N-D-L format, which makes it very easy to figure out exactly what gear you’re in at any given moment because every single automatic car manufactured in the last ten zillion years has used this exact same shift pattern, and why would anyone ever want to change it? Well, in the 500L, they changed it. You have auto and manual over to the left, grouped together in a way that leaves you in manual sometimes and automatic sometimes, for no apparent reason and with no obvious method for switching between the two. Then on the right you have neutral on top, and reverse at the bottom, which is counterintuitive to anyone expecting “R” to come before “N” in the world of automatic transmission gear selectors. But these issues pale in comparison to the transmission’s biggest drawback, which is: no matter what situation you find yourself in, no matter where you’re sitting, no matter where you’re parked, the 500L rolls in the exact opposite direction of what you want. If you had been stranded on a mountain with your 500L for the last month, with no food or water, and you finally found a path that leads you back down the mountain to safety, the 500L’s transmission would find a way to roll you back up. All of these wonderful features came together in possibly the worst transmission-related incident I’ve ever experienced in my entire automotive life. Picture this: we’re trying to parallel park in a tiny spot on a narrow street with dozens of Istanbul drivers stacked up behind me, all of whom use the horn with the same regularity that you or I might use the mirrors. So I’m backing into this tiny spot, and of course it’s night, and of course the 500L doesn’t have sensors or a camera, and of course I have no idea how big it is. So I’m backing up, and HONK HONK HONK from the Istanbul drivers, and I start to go forward, and HONK HONK HONK, because I’m still blocking the road, and then I shift into reverse, and the car begins rolling forward, because that’s what the 500L does, regardless of what gear it’s in, even if you’re on a surface with approximately the same overall grade as Nebraska. So I push the pedal and nothing happens, but that’s normal in the 500L thanks to its huge lag time. So I’m waiting for the transmission to kick in, and the people behind me are honking, and nothing’s happening, so I push the pedal even harder, and still nothing’s happening, and now we’ve rolled so far that I’m about three inches away from the car in front of me. And I push the pedal again, and HONK HONK HONK, and then I look down and discover I’m not in reverse, but rather I’m in neutral, because the transmission lever is arranged with the logic of plane crash debris. So I shift into reverse, and do you know what happens? We CONTINUE to roll forward, now only about an inch from the car in front. So I JAM the accelerator, and I wait for the Hesitation Period, and FINALLY the car starts to move backwards, except now it’s going at roughly the speed of a bullet train, and we avoid the car behind us by about a centimeter. So then I throw the car back into drive, which is of course manual mode, and now we’re rolling again, and the transmission is hesitating, and HONK HONK HONK, and I can’t see where I’m going, and after about 30 seconds of this I realized I absolutely do not need to park in Turkey, unless I come upon a spot that was recently vacated by a box truck. In conclusion, I liked the Fiat 500L for its styling, and its interior, and its cargo room, and its fuel economy. And then, over in the “con” column, I would have to put “transmission designed by Satan to make us all yearn for self-driving cars.” So I’d have to say that I don’t recommend the 500L to anyone on any sort of vacation, even if it’s the last rental car available in the entire city. Because if you ask around, maybe you can find a mule.